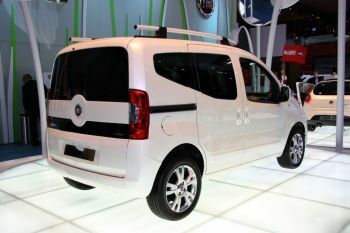 Previewed at the Geneva Salon earlier this year, and having being steadily rolled out over the major European new car markets ever since the summer began, the innovative Fiat Qubo has made its official motor show debut this week at the 78th Paris Mondial de l'Automobile. 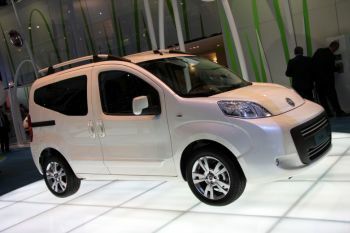 Qubo is the name of the new vehicle being sold by the FIAT sales network. An original name that plays on the idea of “cube”, which may not always be complimentary in all contexts, but in any case clearly evokes the strong points of this model: reliability and sturdiness, as well as unique and versatile functions. Not to mention the originality of changing the C of cube to Q to tell us that this vehicle is no ordinary cube, but rather a cube with a twist. The Qubo is targeted at a Client who is a non-conformist oriented towards substance rather than show, a strong personality who is emanates confidence of his or her own well-informed choices. 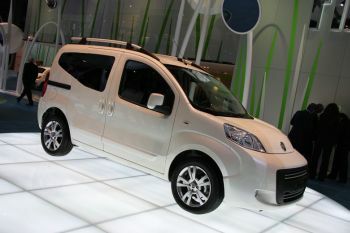 Qubo goes well beyond the concept of the MPV venture as a pioneer into the concept of a “free space” vehicle, capable of satisfying a variety of needs for mobility. In fact, it is a highly functional vehicle with two sliding rear side doors, flexible interiors capable of offering up to sixteen different solutions. If so desired, it is also available with a front passenger seat that can be folded into a table and then flush with the boot level, making it possible to load objects measuring nearly 2.5 metres (a true record for a vehicle that measure only 3.9 metres). So this is the vehicle that lets you do anything you like, just as one would expect from a multipurpose vehicle, because it is as easy to handle as a city car and as spacious and comfortable as a MPV. But when compared to an MPV, the price is better for the same versatility and more compact dimensions (3959 mm long and 1684 mm wide, this boasts the best maximum capacity boot among all the vehicles in its class). Moreover, Qubo fits in anywhere (urban and suburban), ensuring notable fuel savings -thanks to the 1.3 Multijet 75 hp engine, also available with the robotized "Dual Logic” six-speed transmission – which all translates into 1000 km of autonomy and reduced operating costs (30,000 km for the first service check). All in all, this vehicle is also about as green as can be, reducing CO2 emissions to 119 g/km with the 1.3 Multijet engine and offering an optional particulate filter. But that's not all; Qubo manages to offer all this and at a highly competitive price, in keeping with other segment B vehicles, while including an integrated Blue&Me communications system (hands free, vocal and steering wheel commands, on-board text messaging, and a USB port). Sales began in France in June while Austria and Hungary. Italy, Poland, Switzerland, and Spain were next; this month it is slated for Germany, Holland, Ireland, and November for Belgium and Greece (next year, Great Britain and Denmark should conclude the cycle).